Tai Chi Zero is one of those movies that you can't believe exists until you actually plunk down in the movie theater and watch it unfolding gloriously and weirdly before your eyes. 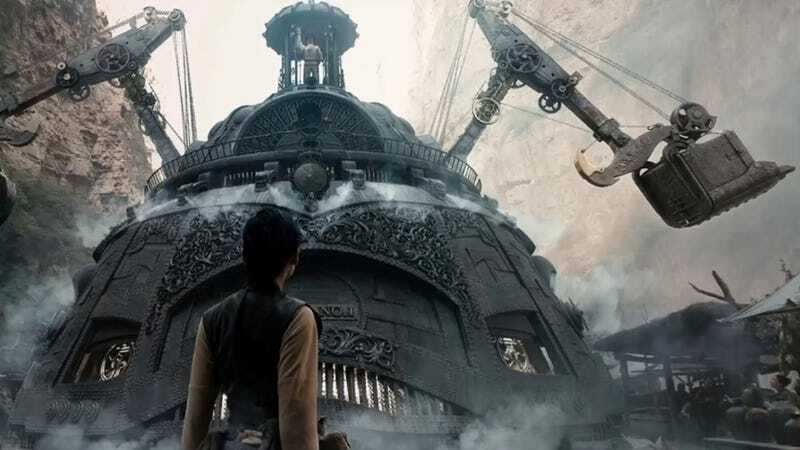 It's a historical kung fu movie mashed up with an action-packed video game, and then jammed inside a giant steampunk explosion. With jokes. It's also a kung fu movie that throws in a zillion references to the kung fu genre for fans — while also welcoming viewers who have never seen a kung fu movie in their lives and just want some escapist fun. Basically, if you like fighting, underdog heroes, goofy romance, and giant iron machines that breathe fire, this movie is your destiny. Director Stephen Fung's previous flick was the adorable Jump, a Hong Kong hip hop dance comedy, and with Tai Chi Zero he proves himself a master of physical comedy and action-insanity. Yang Lu Chan (Yuan Xiaochao) is dubbed "the Freak" as a kid because he has a horn-like growth on his head that is a mystical sign of his martial arts gifts. Whenever somebody punches his horn, he turns into a magical fighting demon — and that's how he gets drafted into the military, where he's taught kung fu and uses his powers to raze whole armies. Except the Freak has a loftier goal. He wants to learn the greatest fighting style of all — the Chen style of kung fu, also called tai chi. So the Freak sets out on a quest to win over the people of Chen Village, where the elusive Master of the Chen style is masquerading as the humble Uncle Laborer. Poor Freak gets beaten up by everybody, including the Master's badass daughter Chen Yunia (Angelababy). While the Freak's quest to learn Chen style is unfolding, another quest is going on too. Yunia's fiance Fang Zijing (Eddie Peng) has returned from his studies in London and is trying to convince Chen Village to allow one of those newfangled steam trains to pass through the town — bringing riches and helping them into the modern age. But poor Fang is no Chen — and all the Chens make fun of him for his weird ideas about electricity and trains. The tension between modern Fang and the traditional Chen villagers becomes a funny-but-also-poignant tale that touches on China's struggles with industrialization. When the villagers reject Fang's train plan, Fang's secret British girlfriend arrives with a giant machine to destroy the village and lay train tracks through it. They start ripping everybody's homes apart with no regard for all the grandmothers and grandfathers. So it's up to the betrayed Yunia and the bumbling Freak to save everybody — with a little help from Uncle Laborer. Fight scenes in Tai Chi Zero deliver the epic awesomeness of a true kung fu movie, but they are leavened with Jackie Chan-style silliness. Plus, there are a lot of hilarious videogame style touches — "KO!" pops up on screen when Yunia knocks Freak out. It's not the full Scott Pilgrim vs. the World style, just a few touches, and they work nicely with the ancient-meets-modern feel of the entire flick. As the shenanigans and action build to a crazy crescendo, you'll be laughing and rooting for our heroes at the same time. It's a great ride. But be warned — this is the first movie in a trilogy, and you'll be left on a cliffhanger. The main action is resolved, but there's a lot more to come in January when the sequel Tai Chi Hero will hit theaters. If you want some creative escapism this weekend, Tai Chi Zero is your ticket. Whether you're a kung fu fiend or a complete amateur, you'll find something to love in this tale of kung fu traditions vs. Western technology.